It was former player and administrator Robert Thomas Rush who introduced the Collingwood motto Floreat Pica (translated to “May the Magpies prosper”). Collingwoodfc.com.au will be taking an in-depth look into the Copeland Trophy in the lead up to this year’s gala event on 4 October. The history, the medals, and the winners will be featured in a series published on the club's website. The player awarded second place in the best and fairest voting is awarded the R. T. Rush Trophy. Last year's winner was Scott Pendlebury. The Collingwood motto Floreat Pica or “May the Magpies prosper” was introduced by former player and administrator, Robert Thomas Rush. “Bob” Rush coined the term when he was acting club treasure after the 1910 premiership. He believed it helped reaffirm Collingwood’s uniqueness, spirit and prosperity. Rush made his debut for the Magpies in 1899 in round two against Melbourne. His first game was disheartening with the team only managing four goals in a 27-point loss to the visitors at Victoria Park. Thankfully the experience did not deter him from playing with Collingwood as he continued with the club for another ten seasons amassing 143 games. Rush was considered a fine defender with excellent pace and agility. He tasted premiership glory as a player in the 1902 and 1903 season. The champion back-pocket defender was appointed assistant secretary in 1903 and became the club’s treasurer in 1908, immediately after his retirement. He continued his position as treasurer until 1950 and during that time was a League delegate for 29 years (1927-45) and president of the Australian National Football Council for eleven (1935-45). 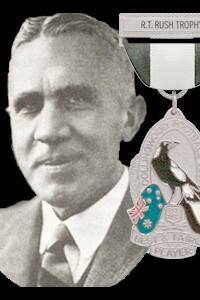 His greatest acknowledgment is arguably his induction into the Order of the British Empire for his services to football in 1961, the only Collingwood player to ever be honoured in that manner. In the Magpies 1930 premiership win, Rush was given coaching duties because of head coach, Jock McHale, suffering an illness which forced him to miss the game. The team headed into the half 21-points down to the Geelong side that looked tougher and faster than the boys from Victoria Park. Rush sat the team down at the half and pleaded with the players to pick up their intensity because Jock was listening on the radio. The interim coach told the players that Jock would know who was and wasn’t pulling their weight and they needed increase the intensity for their sick coach. Twenty-five minutes later after the teams took the field; Collingwood kicked 8.6 to Geelong’s solitary behind and secured the club’s 10th VFL/AFL premiership. Robert Thomas Rush continued supporting the Collingwood Football Club up until his death on 3 March 1975. 2004 - Paul Licuria, Ben Johnson and Shane Woewodin. Rush was inducted into the Collingwood Hall of Fame in 2008. The R.T. Rush stand was erected at Victoria Park in 1966. For fifty years Bob was a member of the Mercantile Club and he was at one time Australia’s oldest rower. Up until the age of 90 he would row from Mercantile to Dight’s Falls and walk to Victoria Park to have a beer with the lads. Information used to compile this article was sourced from "Kill for Collingwood" by Richard Stremski. A special mention to Peter Furniss from the Collingwood Archives Committee who supplied additional information used in this article.